Captain Legree, the oldest GGFA member, at the Gullah/Geechee Seafood Festival. 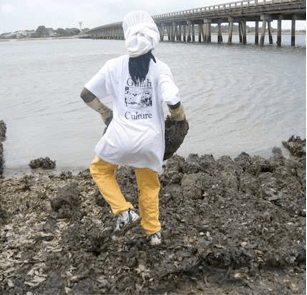 The establishment of the Gullah/Geechee Nation took place in July 2000 to protect the cultural Queen Quet oyster replanting. 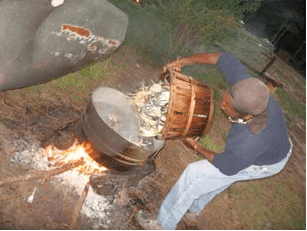 Legacy and rights of the Gullah/Geechee people. Similar to other coastal communities, this legacy includes a long-standing dependence upon fisheries, which play a major socioeconomic role for the Gullah/Geechee community. The fisheries that support the Gullah/Geechee people face a multitude of threats largely derived by man-made stressors in the form of urban, industrial, and agricultural development within coastal watersheds and overfishing. 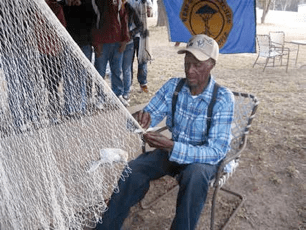 The Gullah/Geechee Fishing Association (GGFA) was founded in 2010 in order to strengthen advocacy and education efforts to protect fishing rights and the cultural heritage of the Gullah/Geechee people. The AFS Equal Opportunities Section was able to contact Queen Quet, Chieftess of the Gullah/Geechee Nation and a founding member and Secretary of the GGFA, to discuss the role of fisheries and the major fisheries-related issues impacting the Gullah/ Geechee Nation. 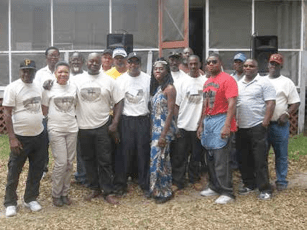 What is the mission of the Gullah/ Geechee Fishing Association? To advocate for the rights of Gullah/Geechee and African American fishermen and fishery workers of the southeast. To share traditional fishing methods with the next generation. To restore access to the areas and factories needed to sustain the seafood industry in the Gullah/Geechee Nation and southeastern United States. Can you provide us with a history of the Gullah/Geechee Nation (referred to henceforth as “the Nation”) as well as the origins of GGFA? login_url=”/membership/member-login/” class=””] presented at the enstoolment ceremony that now presented “Queen Quet” (www.QueenQuet.com), which became the official title name for the duly elected leader. One year later, they returned to this location to present their flag and constitution to the world and to have the 21-page constitution ratified and signed by the Wisdom Circle Council of Elders for the Gullah/ Geechee Nation. Go to www.gullahgeecheenation.com for more information. Please explain the historical and current importance of coastal fisheries for the Nation, from both an economic and social standpoint. Since the 1600s, Gullah/Geechees have historically harvested from the Intercoastal Waterway in the manner that their indigenous American ancestors did as well as their African ancestors did before their kidnapping along the west coast of Africa. Since that time, Gullah/Geechees continue to live from the land and the waterways. The top industries of the Gullah/Geechee Nation are agriculture, sea work (including harvesting, cast net making, and boat building), and tourism. Thus, the coastal fisheries are essential to the literal physical sustainability of Gullah/ Geechees and to the Gullah/Geechee Nation’s economy. 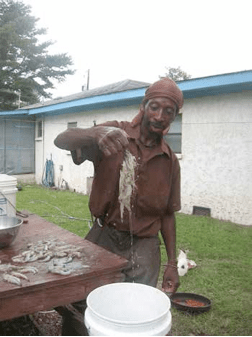 What is the current state of the fishing industry in the Gullah/Geechee community? What are the major fisheries (shrimp, shellfish, sea trout, etc.)? The Gullah/Geechee fishing industry has been in decline due to the harassment from the Departments of Natural Resources that fine Gullah/Geechee fishing families for harvesting in their historically traditional manner. They are fined for amounts and sizes instead of being recognized as a unique indigenous traditional group. In addition, harvesting is being done by fleets coming in from other areas. Climate change damage is taking place due to resort overbuilding as well. So, these threats have caused [declines in] blue crabs, oysters, shrimp, catfish, mullet, spot, croakers, etc., which are staples of the Gullah/Geechee fishing industry and diet. What are the primary issues impacting Gullah/Geechee fishermen and the GGFA? Ronald Goodwine of GGFA shows off his shrimp catch. The primary issue for us at this point is getting special recognition established with the general assemblies so that Gullah/ Geechee traditional fishing can continue without jailing and fines taking place. How do state and federal policies relating to fisheries regulations and environmental policy impact GGFA fishermen and the industries associated with fishing (distribution centers, markets and retail businesses, processors)? They have priced Gullah/Geechees out of the creeks due to the numerous permit fees and fines. As a result, many stopped fishing altogether. How can professional societies such as the American Fisheries Society assist with addressing issues that impact GGFA and the Nation? They can work with us to help address the fact that Gullah/ Geechees are federally recognized as a national minority. Given that fishing is part of our Gullah/Geechee traditions that literally keep us alive, we need help getting our bill to the floor of general assemblies so that special IDs can be given to Gullah/ Geechee fishing families so that they can continue our traditions and pass these on to the next generation so that the culture will continue. We can also use your help with funding resources so that we can continue our work to educate others on ways to protect and restore our coastline and improve water quality and sustain the sea creatures that are necessary for us to have a healthy ecosystem and future harvests of seafood.